It was four in the afternoon and I’d finally finished everything that was holding me in Bongaigaon. There was a slight drizzle starting to squirt down and the sky to the west was dark and ominous. The guys were telling me to stay just one more night and I caved in, but on the three-minute drive back to the hotel I got a taste of being on the road again. My bike was completely packed and ready to go and it was time to go. Goodbye Bongaigaon. I pulled back onto the highway close to the spot where I had been hit by the truck. It was exactly as I remembered it, complete chaos. Nothing had changed, huge trucks barreled down the wrong sides and police sat along the side not caring one bit. Biswajit drives to and from work along the route where I was hit and he told me my blood was on the road for ten days. It was strange getting onto that highway. Three months earlier I was on my way to Sikkim and got stopped in my tracks. Now I was back on track heading to Sikkim. It almost felt like nothing had happened and I just took a detour for a couple of weeks before coming back to the highway. I didn’t know in the beginning what would happen to my adventure. I told myself I would continue for sure, but I think in the back of my mind I was scared a bit. I said goodbye to my motorcycle months ago with the fear that we may never be free again together. A rush of adrenaline filled my body when I opened up the throttle, felt the warm summer air, and realized I had done it. Unfortunately my bike’s exhaust was still a bit messed up and my leg still in some pretty bad pain. I rode 120 km that first afternoon until it got dark and I found myself in Alipurduar, in the state of West Bengal. The dark skies skirted right along side me the whole way, but I kept dry. In just a hundred km things had changed a lot. The people looked different, the food was different, and the vibe had morphed. When I first stopped along the side of the road, a group gathered around me as usual. Then a guy came up and showed me a picture on his phone of my motorcycle all taken apart. 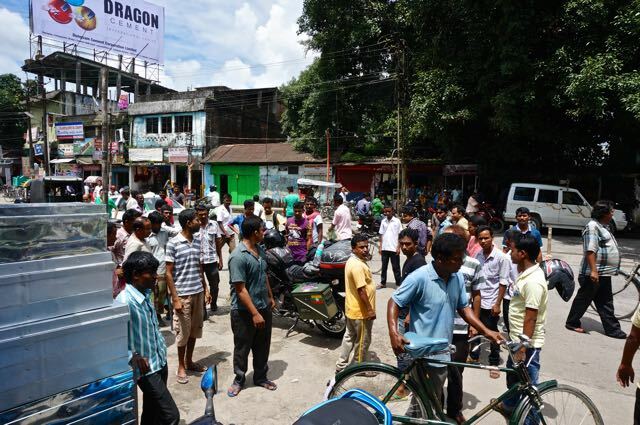 At some point he had been in Bongaigaon and seen my bike, pretty random. Then later when I was wandering for food, I bumped into a stove salesman named lucky that had been staying at my hotel. A real friendly guy who never brought me bad luck. It was just a stop-over for the night and my ankle wasn’t feeling to good. It definitely didn’t like being in the boot and had swollen up huge. I found a great little cheap room and melted into the oh so clean-looking bed. I thought I was getting mosquito bites on my shoulders until I realized there were big fat bedbugs full of my blood. I squashed them and went down to give reception the bad news. The manager took one look at my bites and was furious. He knew what it was and yelled at the staff. They felt really bad and put me into a nice room. 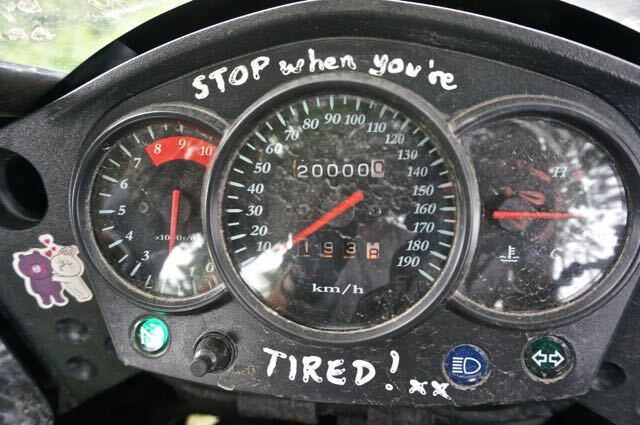 The next morning I aimed for Sikkim and hit 20,000km. I’ve put 15,000 on it since buying in Australia. The route through West Bengal was beautiful. The lush green tea plantations were being picked by big groups of ladies. The tea bushes look perfectly manicured like a garden. The ladies spend all day picking the light green young leaves off the tops and filling the mesh bags hanging from their heads. There always seemed to be a guy in charge of them and they were always super friendly. They would offer me water and snacks. I asked about what the women get paid and it blew me away. They got paid per kilo and the average lady would make a buck or two a day. Someone is making a lot of money off that tea. The ladies all seemed in good spirits though and even let out some grins. The shyness level was high. 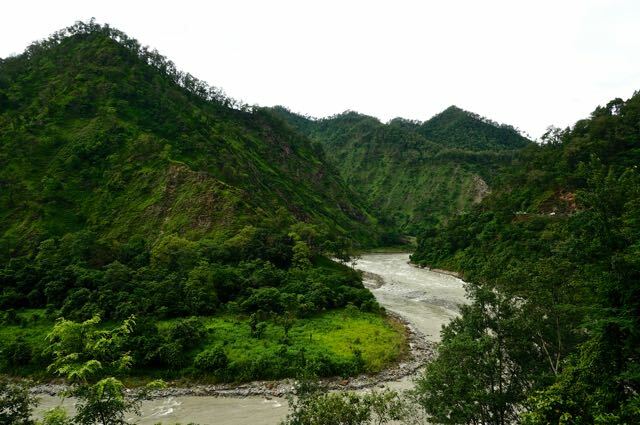 As I started getting closer to Sikkim and heading more and more to the north, the big rivers started flowing out of the mountains. The water had that grayish aqua look that only comes from glacial water. Some of them are being mined by hundreds of people. Then it was time to head north into the mountains. 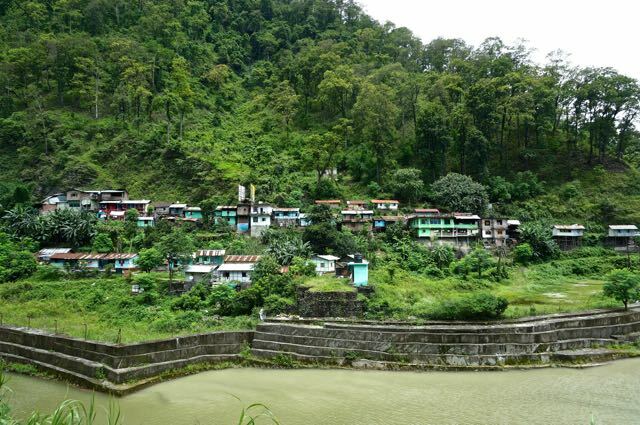 Sikkim was a Buddhist kingdom, then fell under British rule in the 18th century, gained independence in 1947, and was annexed by India in 1975. 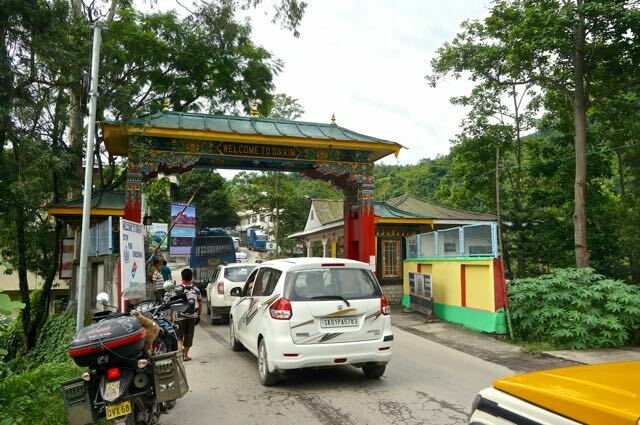 Special permits were needed for a long time to travel to Sikkim, and now it is very easy and all it takes is getting a free permit at the border. It feels like you’re going through immigration and entering a new country. Before the crash, this is where I was super excited to go. It was the next best thing than going to Bhutan. I would have been there in late March, which is one of the best times with great weather. Unfortunately after being crippled for a while I missed this time and was smack dab in the middle of monsoon. After crossing a giant pink bridge covered in prayer flags, I started making my way up the crazy route to Gangtok, the capital of Sikkim. A lot of it is along shear drop offs to the river. It doesn’t make you feel too confident with all the landslides coming down. Packs of monkeys hang out along the roads. 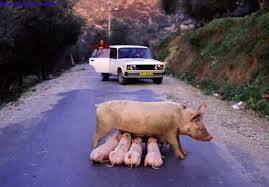 People throw them food from their cars and they aren’t timid. I stopped along the road for a pretty view of the valley and a few came over to check me out. They sat along the edge and gave me a thorough look over. It seemed like they were debating whether or not to tear my throat open. 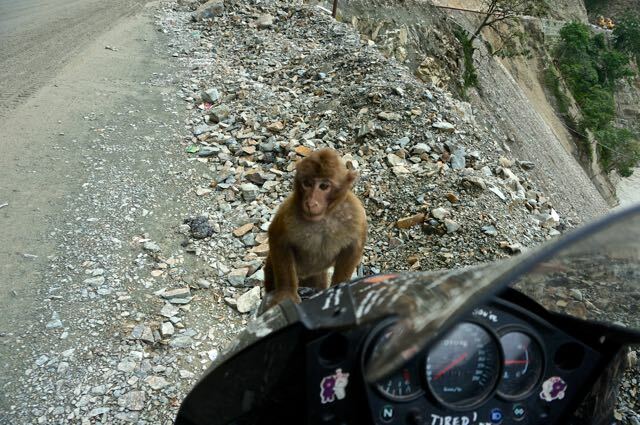 A young one jumped on the front of my motorcycle and slowly started crawling towards me. When I snapped a pic of him he showed me some big sharp teeth and hissed at me. He scared the hell out of me and I got out of there quick. The route gets prettier and prettier as you climb through the hills. The monsoon season transforms the landscape into vibrant greens all around you. The rains also wash the roads out and make it an unfriendly place to be riding. I spent the last hour of the day riding around in a heavy downpour looking for a hotel. The locals told me to expect much of the same every day during this time. Because of road closures and restricted areas, there weren’t many places I could actually. First thing in the morning I back tracked along the same road and returned to the lowlands. The eighty or so km took half the day because of landslides. There was one major slide that I was lucky to get by as quickly as I did. The problem with Indian traffic and drivers is it’s a chaotic mangle of insanity. In a rational world when a landslide blocks the road people will line up in their lane or off the road until it’s cleared, but in India this would sound crazy to them. Instead everyone on each side completely jam packs themselves over the entire road in every lane. It’s not hard to imagine what comes next when the slide is cleared, nobody can go anywhere. I saw a lot of screaming and a couple of fist fights, but luckily me and a couple other motorcycles were able to sneak our way through. There were some tight squeezes and once I scraped one of my ammo cans against the cab of a truck. The trucks and vehicles must have spent the entire day untangling the mess. It was exciting to be heading to a new country and out of India. I crossed at the Panitanki/Kakarbhitta border in the far east of Nepal. It was definitely one of the more laid back borders I’ve dealt with. I could have easily just drove right over the bridge and into Nepal like everyone else. Nepalis and Indians were coming and going pretty freely. Rickshaws brought people and goods each way with no questions. A couple small structures were at the start of the bridge next to an unmanned gate. The one on the right handles customs and filling out the carnet paperwork. I found out I had actually missed the Indian immigration a hundred meters back down a small road with a small sign reading “West Bengal Police Checkpoint”. The guys stamped me out and sent me on my way without a problem. Except for they don’t like pictures taken of their building. I got some stern words from the security. 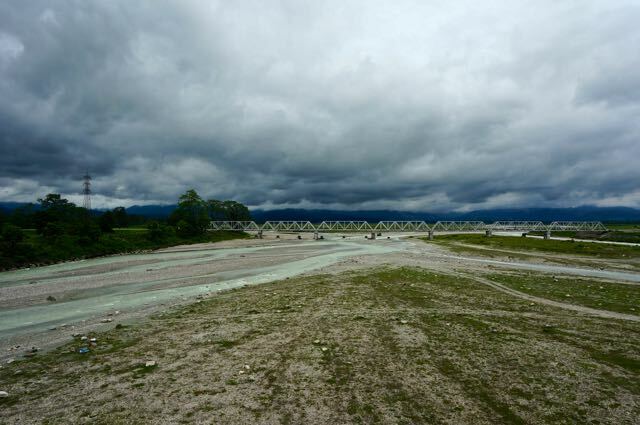 The only thing between you and Nepal at this point is the long bridge spanning a wide river plain. A few Indian soldiers in cammo patrol the area. I could hear them yelling at people who were walking around in the area. It didn’t make sense that they were stopping people from crossing below, but the bridge was open. On the other side you go through the usual visa and carnet process. Friendly Nepalese are all around to welcome you. In the first building you buy your visa from a couple of the more friendly immigration people I’ve ever encountered. I just grabbed a 15-day visa for $25. You can also get a one-month and a three-month. The next building is where a guy will fill out and take a piece of your carnet. It was kind of cool, I saw a few other travelers that I know from online. Rob, a rider that I was supposed to cross Myanmar with, but had to change his dates. Dave and Ghislaine, two Aussie riders who I’ll be crossing China with. Also some people who I recognized from forums. It’s a small group of us out here doing this and it’s neat to watch what the others are up to. 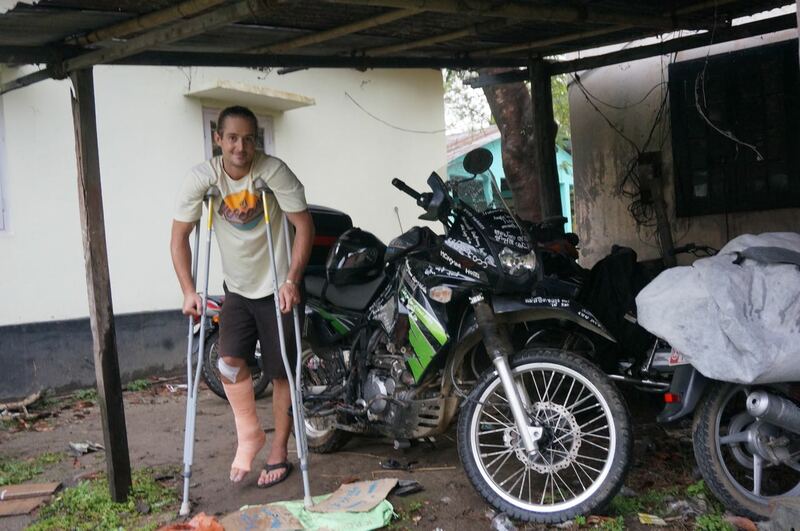 I forgot about the pain in my ankle as I rode into Nepal. I felt like I was finally leaving the crash behind. I sang loudly. Nepal is very similar to India in many ways, but also completely different. 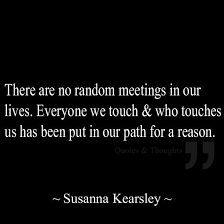 One thing that remains the same are the masses of people who surround you on the sides of the road. This entry was posted in border crossing, Motorcycle world travel, NE India Travel, Nepal travel, Photography and tagged adventure, assam, India, injury, monsoon season, motorcycle, Nepal, Northeast, panitanki border, photography, rain, sikkim, tea plantations, travel. Bookmark the permalink. We saw your name in the book! Nice!! I love finding other riders. I saw your post about the ride to Kathmandu, I took that too. Awesome road!! I’m in Rishikesh, India now.